As 2015 draws to a close I find myself reflecting on all that has happened and it was a great year by any measure. It was just about this time last year that we learned that the boat that would become our “new” Pandora was for sale and that we’d be parting ways with our “old” Pandora, the boat that we really thought was going to be our “last”. Well, we expected that it would be the last one that we used for more than a “cocktail cruise” on the river. We honestly thought that the next boat we owned was going to be an electric launch or some other stately craft for evening jaunts with G&T in hand. Well, we now own perhaps the “perfect” cruising boat although it wasn’t quite as perfect as the surveyor described in his report as she has been much more of a “money pit” than we expected. However, the outflow seems to be moderating so let’s hope that the next few months aboard won’t uncover more surprises. Of course, the first year of owning a boat are always full of surprises and I do realize that she’s a lot more complicated and will surely remain demanding. Of course, don’t forget that she is a boat, after all. It’s interesting how life changes and while we were very disappointed that I wasn’t able to get Pandora to the Caribbean (see past posts from November for more about that), my “let’s make lemonade out of lemons” approach to life has served us well as we plan our trip to Cuba. The more that I learn about what’s on the horizon after Cuba opens up for easy travel by Americans, the more convinced I am that now is the time. Some predict that in the first year that the sanctions are formally lifted as many as 60,000 yachts will visit Cuba. That’s an alarming number when you consider that there are very few marinas and only a handful on the north shore of the island, the largest in the Caribbean, is less than 100 miles from the US. As an interesting aside, I also read that other islands in the Caribbean as well the Bahamas are bracing for reduced visits by boats as the “hordes” head to the “forbidden island” to see for themselves what they have been missing. One thing for sure is that the “buzz” in the cruising community is more like a “roar” about what’s in store. And, in spite of getting all of our needed approvals to allow us to visit Cuba aboard Pandora, some details remain to be sorted out from a logistics standpoint so I guess there’s still more to do till we get everything in order. 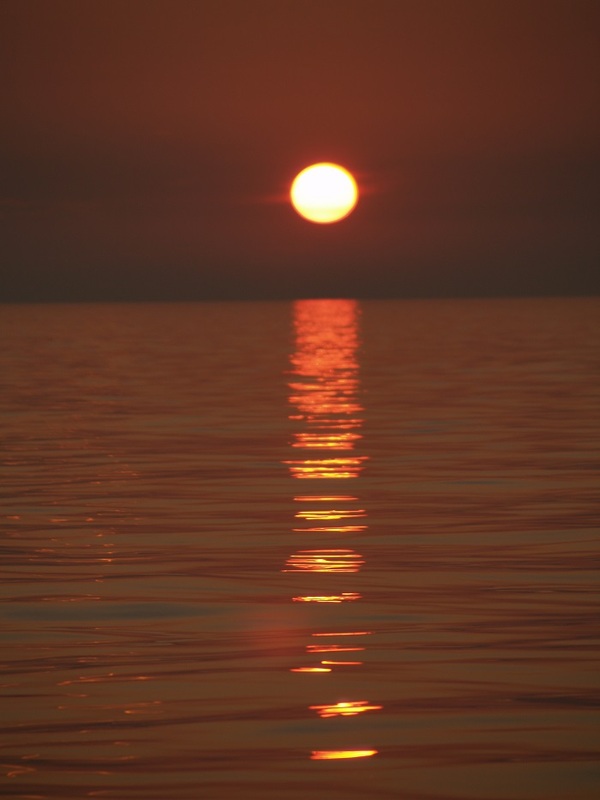 So, enough about what’s on the horizon, how about what’s bobbing around in our wake? Certainly the biggest news of the year was the marriage of our oldest, Rob, to his new bride Kandice in August. The wedding was in Baltimore, near where they live. What a singular experience. Brenda did a wonderful post on this and I am confident that I can not improve on her near breathless reporting. 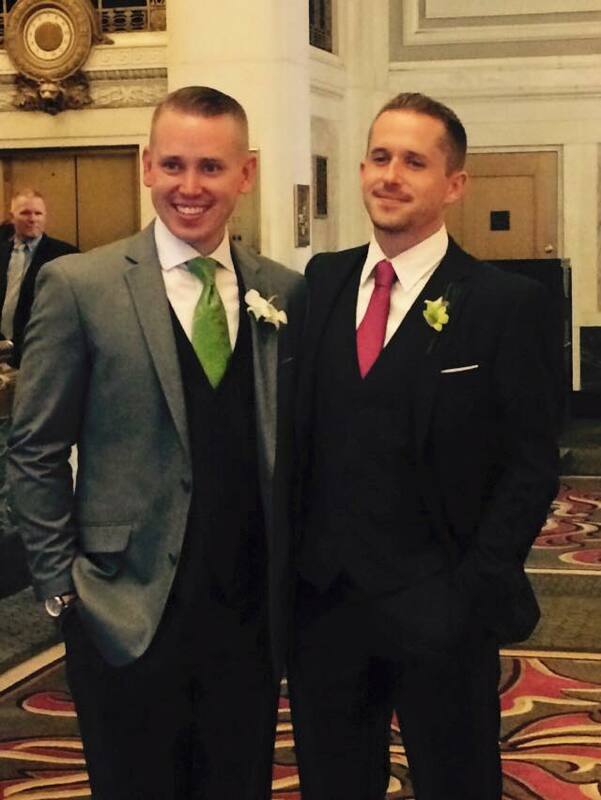 Our younger son Christopher was the best man and I wish that I could remember his words of his inspired toast to the bride and groom. Both of our boys embody the notion that each generation is better than the last. On the “nautical front” I spent much of my time over the summer working to get Pandora ready to head south but Brenda and I were able to make time to take her on a “shakedown” cruise to Nantucket with fair winds on our way there and returning. How often can you say that? The weather was wonderful and with a “proper dink” we were able to anchor across the harbor from town and avoid the ridiculous mooring fees that are creeping up near the three figure mark. 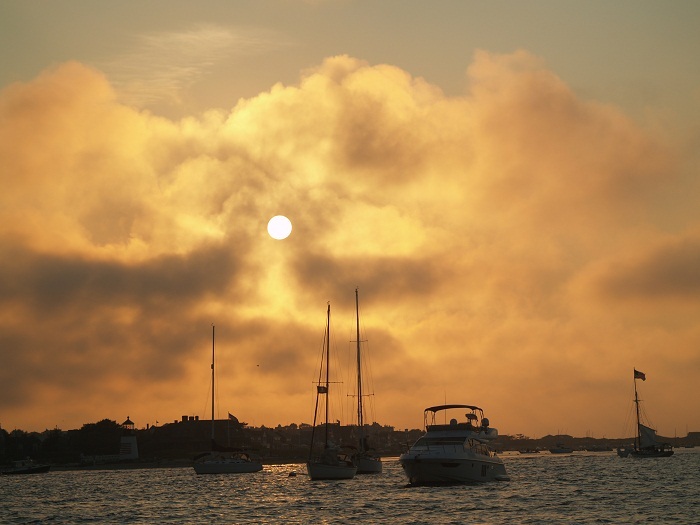 Mooring or not, we still enjoyed the same beautiful sunsets as the “paying customers”. Being there on “new” Pandora was a far cry from our first visit there so many years ago. I am hopeful that will prove to be a metaphor for our cruising life aboard her in the coming years. 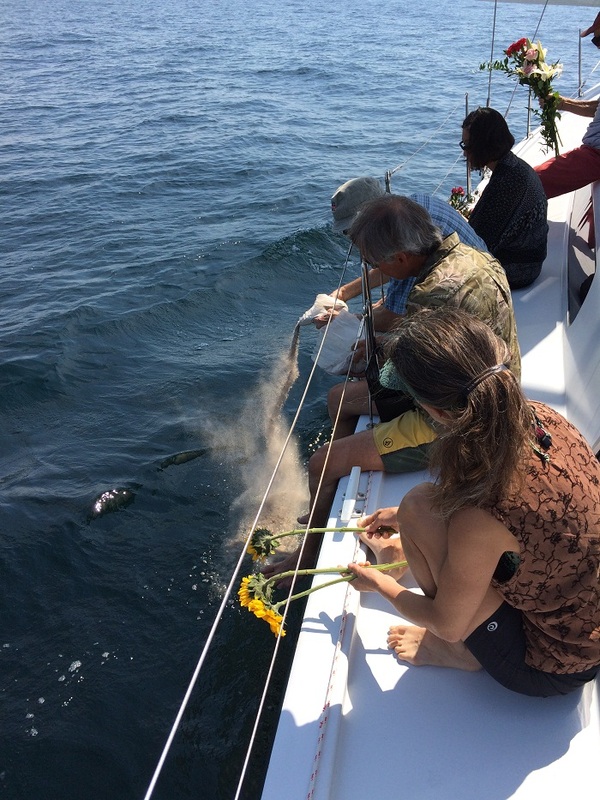 Earlier in the season, Pandora provided the “ride” for my good friend Ken and his family to scatter his parent’s ashes in the waters of Block Island Sound. That experience, followed by a lovely reception at the Stonington Harbor Yacht Club made for a wonderful and fitting tribute to much loved parents. I also had yet another visit to Nantucket with my good friend Craig, as part of a week cruise “south of the Cape”. 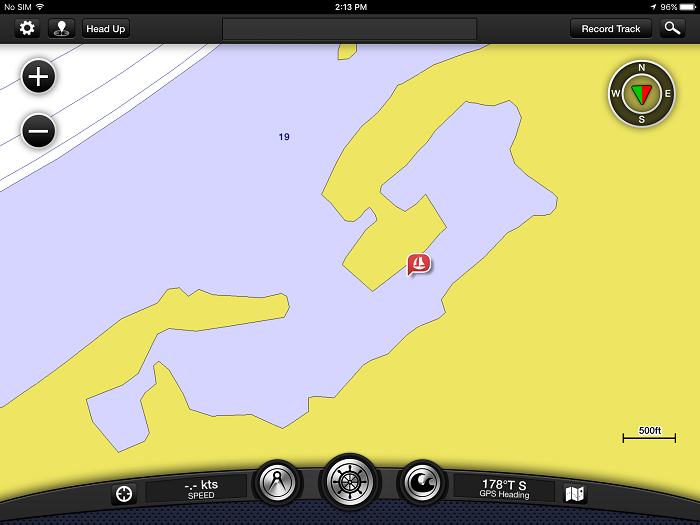 It’s certainly a lot easier to make distance with a 47′ boat than back in the days of, shall we say, less capable craft. We had a really nice week on the water and he only called his office a few times. Brenda and I spent a lot of time making our way up and down the ICW last winter as we moved Pandora south along the Florida coast and Keys and then back up to North Carolina where she was sold. 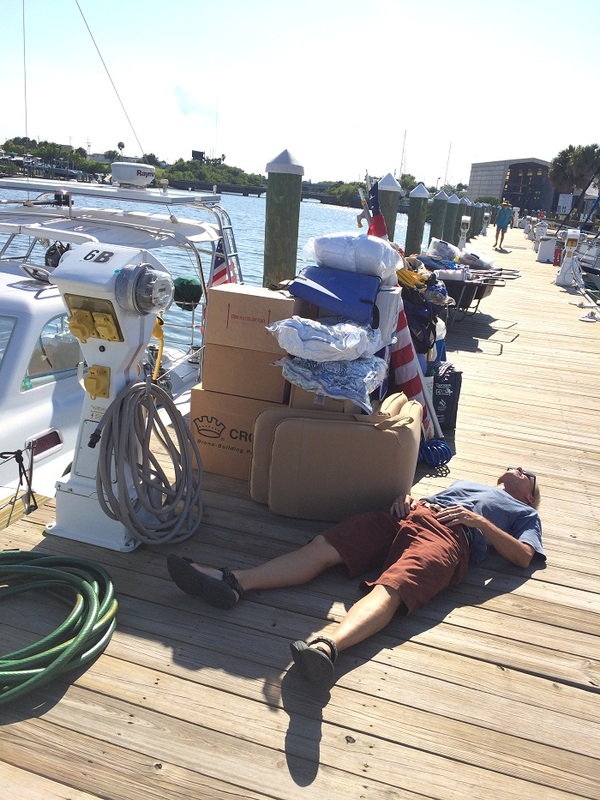 Mercifully, we were only two boat owners for a few months. 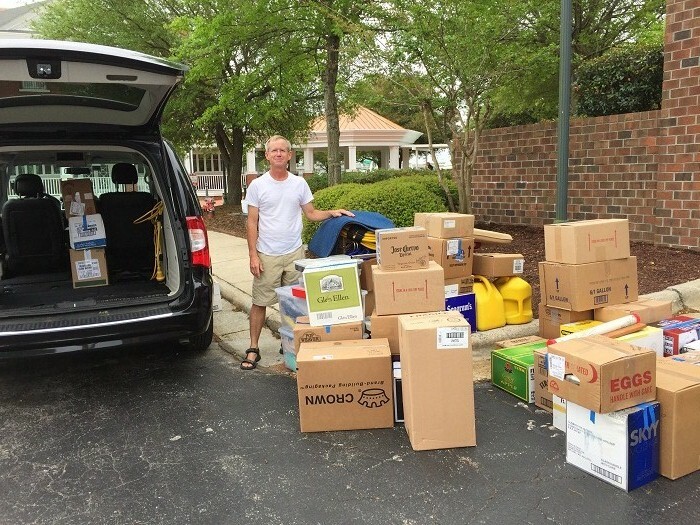 What a pain it was to unpack 7 years of stuff. And load it onto another boat. Brenda’s take on all of this? We are way too old for this. Sometimes it feels that way to me. 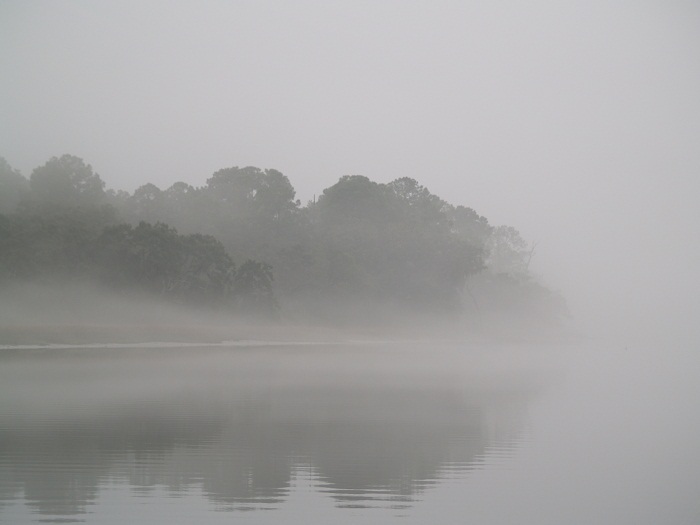 In our too-ing and fro-ing, it was a source of constant wonder to see the sights along the ICW. 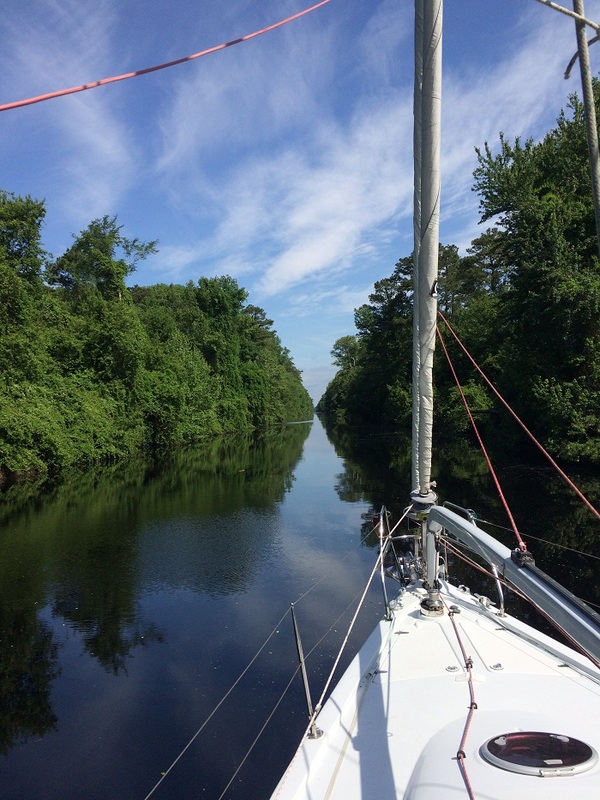 The serenity of the Dismal Swamp Canal cannot be beat. 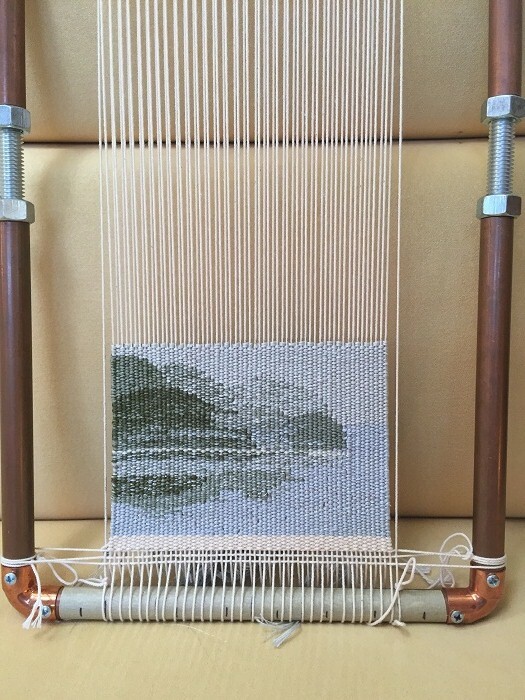 The morning haze proved to be a source of inspiration for Brenda who did a tapestry along the way. It was moments like this that she used to recall the scene. 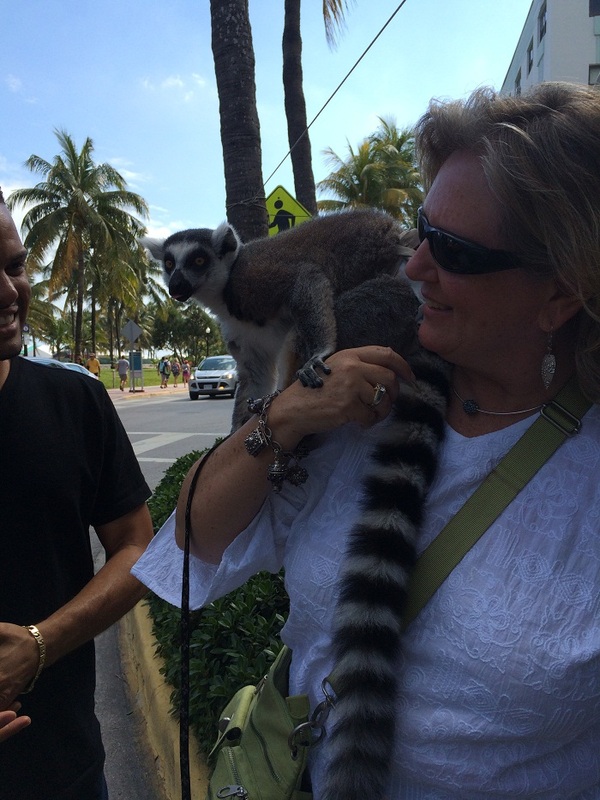 We also made friends along the way. Some more unique than others. Perhaps none more memorable than our Canadian friend “Cricket”. 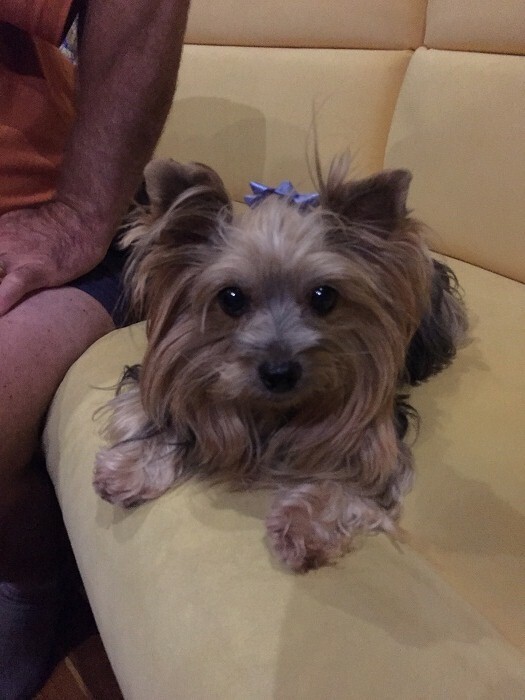 She’s almost cute enough for us to abandon our “no pet policy” aboard Pandora. Well, not quite that cute, but pretty darn close. For sure, if we relent and do get one of own, the name “Cricket” will be a strong contender. 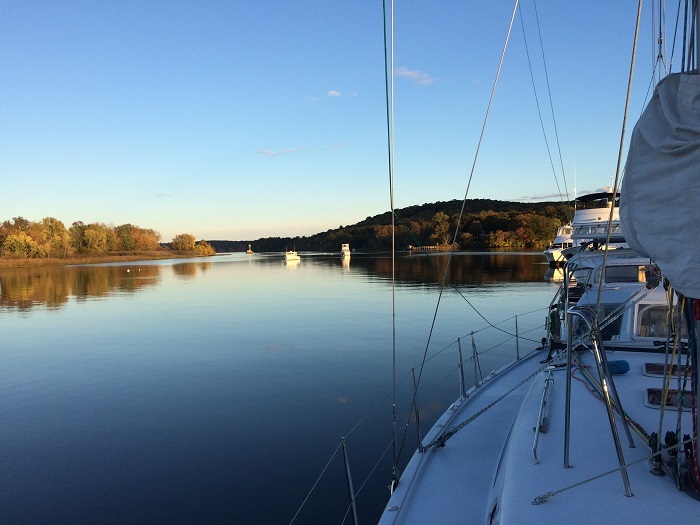 We had some wonderful serene moments on the CT River near home. I want to be sure to note my most loyal crew member who endured many changes of plan and ended up helping me take Pandora to Florida after abandoning our run to the BVI. Nice legs Jim. 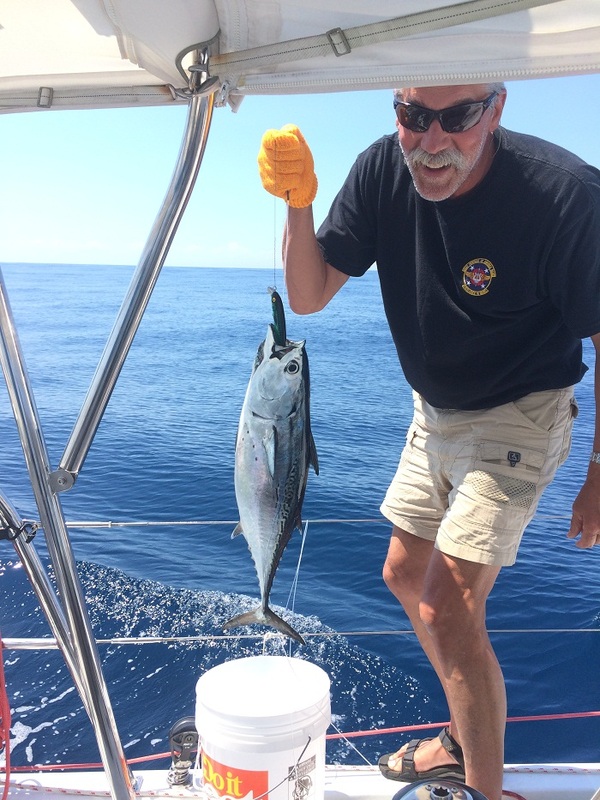 Nicer tuna. Of course, I won’t forget my chance encounter with the USS New Mexico off of New London and the one post that won me an official cap and challenge coin. Perhaps I’ll get lucky and even get my first “ride” on a nuclear sub. Stranger things have happened. One way or the other the “new” Pandora will take us places that we never imagined and do so in great style. One thing for sure is that she will be true to her namesake as having her has surely “opened Pandora’s box” from Brenda’s perspective and endless possibilities from mine. Here’s to a wonderful 2015 and an exciting (but not TOO exciting for Brenda) 2016. On Monday I received confirmation that my SNAP-R application to “export” Pandora to Cuba had been approved. Oddly, when I opened it I sort of expected to hear trumpets blare or swelling strings. Alas, no such luck. What greeted me was this. The document was encrypted behind a login that took me nearly half an hour to figure out. So much for my careful record keeping on login procedures. Well, I finally was able to open it. My login and password were the same. Go figure. Anyway, I opened the document and I have to say that my heart rate was a bit elevated. I was excited to learn.. Are we going to Cuba? Yes, we got approval! I was excited. Well, only for a moment until I read the first of eight “conditions” that my approval included. #1 The vessel must sail directly to Cuba. After all of the discussion about Cuba I thought that I had considered every option and just expected to receive a simple yes/no in answer to my application. So, what’s a cruiser to do? I tried my contact in the Commerce Department and learned that he is on vacation this week . Not to be deterred, I called the help line on my approval document and asked if I could get that restriction removed. The answer…NOPE as there had been no reference to my desire to cruise from east to west in my application. So that wasn’t possible under the terms of my approval and I’d have to start the process all over again and resubmit a new application. NOOOOOOOOO!, not again. It just didn’t occur to me that they’d include that restriction before I made the application. Besides, the Q&A document on their website states that the requirement of “must depart and return to a US port” restriction is no longer in force. Who knew? Feel sorry for me? I do. No rest for the cruiser… I guess I am beginning to agree with my cousin Sue who told me “Bob, your retirement is exhausting me”. Well, I will get over it. Perhaps I’ll have to drink regular coffee, well only one cup or Brenda will push me overboard. No, better stick with the decaf. I am sure I’ll feel fine by next Monday when my buddy Mark in the Commerce Department returns from vacation. I hope he’s feeling rested by then too. If we go, we’ll know where we are. It’s Saturday afternoon and only two days are left until we close up the house to head south for the winter. Of course, along the way, Brenda and I will spend time with our sons and new daughter-in-law in Baltimore but after Christmas we’ll jump on a plane and head to Florida to re-board Pandora. I have been writing a lot about our “plan” to go to Cuba and I still don’t have a definite “you go Bob!” from Uncle Sam. It is looking pretty good as we are already “partially good to go” having heard back from the folks at OFAC, the Office of Foreign Asset Control. What I mean by “partially” is that I was told by someone from that office a few days ago that “as long as you feel that your travels to Cuba fall under one of the twelve categories of travel that are legal, than you can go and stay as long as you need to”. What I really wanted was something in writing but was told “that’s not the way we do it”. As hard as I tried and as many times as I reworded my questions, I could not get a definitive answer confirming that we could go. It seems that the best anyone can get is confirmation that “you are fine and as long as you feel…”. I guess that will have to be good enough. So, I guess Brenda and I can go and the writing that we do in our blogs, the articles we write for other publications, along with the talks we give put us solidly within the journalism category. Now all that’s left is approval regarding our Commerce Department SNAP-R application, a license to export Pandora to Cuba and re-import her when we return. This is the same form that you’d use if you wanted to take a ship load of grain into Cuba or if you wanted to bring in materials to build some tennis courts in Havana, something that a friend of mine is working on. Yes, it seems that Cuba has tennis courts or will have them soon, assuming that my friend gets his SNAP-R application approved. My contact at the Commerce Department, who’s been handing my application, told me that he thinks approval is pretty likely and that I should hear by December 30th. That would be terrific and I am encouraged by his comments. As Brenda and I will be leaving the US to head to the Bahamas in a few weeks, I have put off purchasing charts of Cuba with the thought that I didn’t want to spend a lot of money on charts etc for a trip to Cuba if we do not get approval. Well, time’s slipping by and while I don’t have confirmation yet, I am about out of time so I had to go ahead and order what I needed. So, yesterday I ordered three of the four regional Cuba chart books that are published by a company, NV Charts out of Germany. The only book that I didn’t purchase was the NE quadrant as we don’t plan on cruising that part of the coast and at $90 per region, I didn’t want to purchase what I didn’t need. These charts are “hot off the press” as they finished up their final work in Cuba in February of this year. That’s very encouraging as I am a bit anxious about having good quality navigation information for an area that hasn’t seen many cruising boats for the last 50 years. 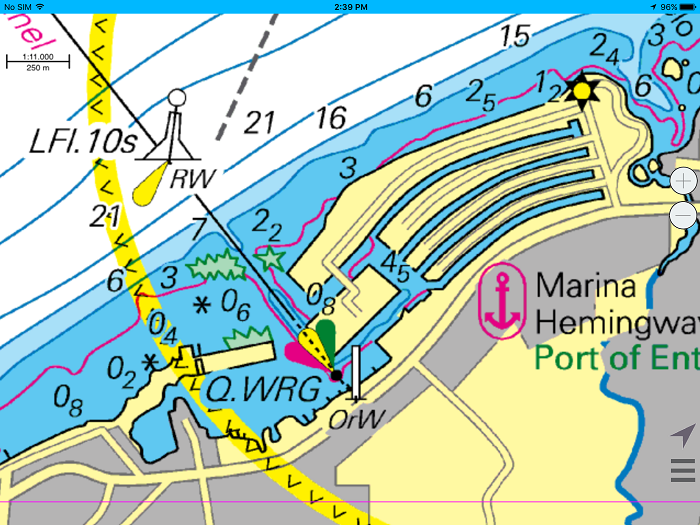 I have relied on my Garmin Blue Chart Mobile iPad charting application as a backup for my Raymarine plotter for several years now and when I installed the Cuba charts I discovered that the charts for Cuba are not very good. While some areas seem pretty good, here’s a close up of the harbor near Havana where Marina Hemingway is located. 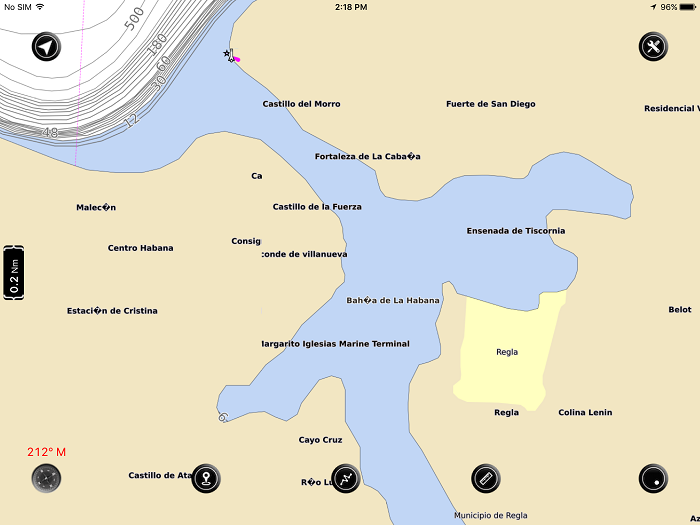 From the perspective of the Yaching Community, it is arguably the most important harbor in Cuba so you’d think that Garmin’s charts would be excellent Right? Not! It’s pathetic actually and it makes me wonder about the rest of the charts for Cuba, even the ones with a lot of detail. And, a larger scale view of Marina Hemingway from NV Charts, the ones I purchased yesterday. Just a little different. And, there is even more detail when you zoom in. 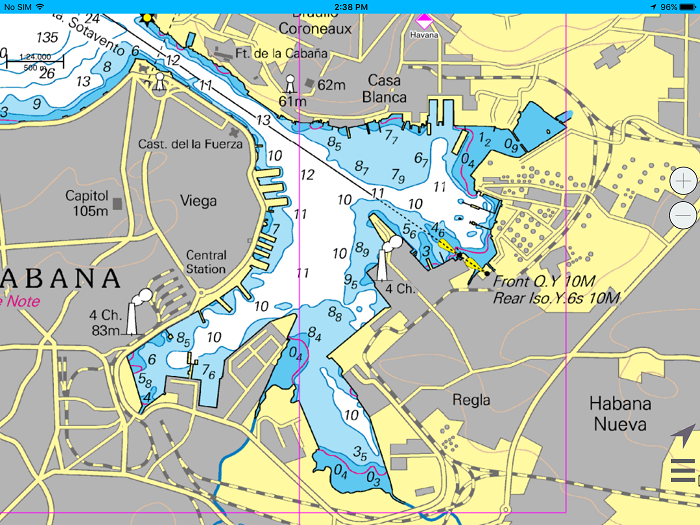 It even shows some deeper spots in the inner parts of the marina. If it’s correct, that’s a high level of detail. Here’s a shot of Havana harbor from another charting program that I paid for and downloaded off of iTunes. Not a great confidence builder. And, let’s not forget that Havana is the biggest port, by a lot, in Cuba. 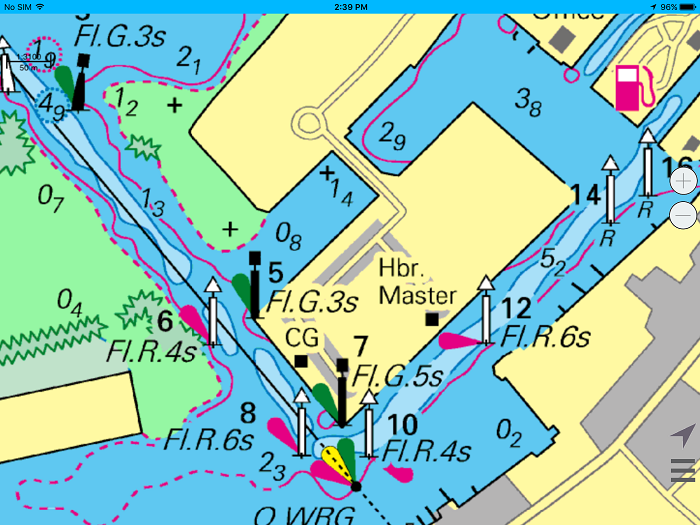 And, here is Havana harbor on NW Charts, iPad version. It certainly gives me more confidence in the charts for other areas as well. I have been told that my Raymarine charts of Cuba are fine but I have not looked at them yet as they are on Pandora and, well, I’m not. However, good charts or not, I do not feel comfortable being on board without backup paper charts. I have a number of friends who’s boats have been struck by lightning which fried all of their electronics so where would they be if they didn’t have paper charts on board? Anyway, I purchased the paper chart books from NV Charts and had the books shipped to FL where Pandora is so I haven’t seen them yet. However, with the limited amount of exploring of the electronic versions that I have done, I expect that they will prove to be quite acceptable. I have read a number of reviews, seen some sample charts and am encouraged by what I have heard. Each book includes electronic versions that can be used on various devices as well as my Raymarine plotter so that will give me great redundancy and solid paper backup in the event of equipment failure. So, while we don’t yet know if we will get the “you go Bob!” but at least we will know where we are if we get there, Cuba that is. Fingers crossed that we will know soon. For now, I have to focus on winterizing the house. Where did I leave those jugs of antifreeze? Cuba’s classic cars. Frozen in time. Just about everyone thinks about classic American cars when they think about visiting Cuba and some say that Cuba is home to more classic cars in use than perhaps anywhere else. For sure, there are more classics on the road as “everyday drivers” there than anywhere else. As a good red-blooded American male, I am particularly excited about seeing all of those old cars, most of which are American made classics from the 40s and 50s. The US led embargo enforced for over 55 years, combined with the very low, $60/month average income for most Cubans has made it is nearly impossible for anyone to purchase new cars and it’s very tough to keep those on the road in running condition. Most of the cars on the road today have been lovingly maintained and passed down from generation to generation all the while being held together with “spit and bailing wire” by their very resourceful owners. Here in the US, classic car owners are focused on keeping their cars in as original condition as possible, using factory correct parts. It’s very different in Cuba and the need to keep their to keep cars running for daily use, means using whatever parts they can make or scrounge along the way. Apparently, it is not uncommon to see GM cars that have engines from completely different makes, perhaps Russian or European cars, a practice that would horrify American collectors. I looked at a fair number of videos on the subject and I think that this 2o minute segment is one of the best. The narrator provides interesting commentary about the car culture of Cuba and what it takes to keep these rolling antiques on the road. At the end of the segment he, along with two guests, explore what the lifting of the embargo may mean for the future of these cars as American collectors arrive. Under the current government it is not legal to sell cars for export which has kept the cars in Cuba for decades. Of course, seeing all of this will depend on my getting approval to visit so for now it’s all speculation. Fingers crossed as now is certainly the time to visit before the “time capsule” that is Cuba is unfrozen and opened up for ever. Cuba architecture. We might just see it yet. It’s Thursday morning, I just got off the phone with my contact at the Department of Commerce and it sounds like I will get word on my application requesting to “export” Pandora to Cuba in about a week. That’s good news as that application is one of two key parts of the puzzle regarding our hoped for visit to Cuba this winter. Based on our conversation, I am optimistic. As you may recall, another key question in all of this has been the regulations on visiting Cuba from a third country, in our case, The Bahamas. Our plan, for some very practical reasons, such as the prevailing winds, mean that we’d like to travel to Cuba from the Bahamas, head south, transit the Windward Passage and explore the southern coast of Cuba prior to visiting Havana and heading back to the US. The good news is that as of November the rules governing travel to Cuba by private vessel were further loosened. In the recent past, you were required to travel to Cuba directly from the US and return directly to a US port, without a stop in any other country. Now, that restriction has been lifted as reported in a very recent document from the Treasury. If you want to read the whole thing, you can refer to item #32 but this is what is says and it’s a major change. As I have mentioned, I need to gain approval to “export” Pandora as well as get a formal “general license” for me and Brenda to visit for longer than two weeks. For a visit of two weeks or less, you can do so under a “self directed license” as long as you believe that you satisfy the requirements for that category of travel. However, you must keep records for five years following your visit and be prepared to share them with Uncle Sam if he asks. As far as approval to “export” Pandora is concerned, that’s looking positive and I expect to hear in about a week. fingers crossed. It will likely take longer for a decision on our application under the “Journalistic activity” statute but we have our fingers crossed. In case you are interested, here’s the wording for the current statute within that category. In my last post I included a short video of travel in Cuba on an “ultra low budget”. I’ll admit that it highlighted a travel approach that was a bit rougher than Brenda would likely be interested in (roaches are not her thing) so today I’ll highlight two videos that I think are more her speed. To that point, my brother Bill has questioned me as to why we want to go to Cuba so hopefully these clips will answer that question. Are you listening Bill? Architecture has always fascinated me, in part because my late Father was publisher of an architectural magazine for many years and the possibility of seeing colonial architecture, some in rough shape for sure, is high on my list. As no blog post is complete without a picture or video, it’s the whole “picture is worth a thousand word thing”, I thought that you might enjoy this short five minute clip of traveling around Cuba and it’s architecture, believed by many to be some of the finest from the Colonial Period in the Caribbean. The segment also touches on Santiago de Cuba. the second largest city in Cuba which has been designated by UNESCO (United Nations Educational, Scientific and Cultural Organization) as a World Heritage Site, for it’s cultural and architectural significance. It’s about 35 miles west of Guantanamo Bay (a place we CAN’T visit) and likely our first stop on the southern coast. There is also discussion of Trinidad de Cuba which we hope to visit as well. I was also intrigued by a PBS report on the state of architecture in Cuba in htis segment. Check it out. Pretty amazing stuff and I sure hope that the opening of Cuba and the development what will quickly occur, doesn’t destroy the “time capsule” charm of today’s Cuba. Oh yeah. One more thing Bill. Here are the rules about bringing rum to the US from Cuba. If I were you, I’d be cautiously optimistic about there being some Cuban rum in your future. Let’s hope that it’s cheap so I can afford to bring some back. Cheap or not, I’ll just have to work hard to focus on the “personal consumption while there” part while I am visiting. Boy, I sure hope that we get to go. Uncle Sam, are you listening? And, if all of this isn’t enough of a reason to visit. For now, Cuba is one of very few spots you might want to visit where you won’t find a single Starbucks or McDonalds. Now that is something to look forward to. Let’s hope that we get to go soon. Visiting Cuba. What will Uncle Sam say? It’s been about two weeks, I think, since I began the process of applying for a license to visit Cuba with Brenda aboard Pandora. As you may recall, visiting under one or more of the “12 rules” is fairly simple now provided that you don’t plan to stay for more than two weeks. Most Americans visiting these days do so as part of a tour and the operator takes care of all of the work so you can just board the charter plane and head down. Simple, right? It is actually, unless you want to go by private boat and stay longer than two weeks. In that case, not simple at all. As word has gotten around about Brenda’s and my plan to visit Cuba for a month or two, the most common reaction is “wow, that sounds terrific”. However, some have then gone on to question us on exactly what our plans are and if we are going to hire a “guide” to show us around. When we say, “no, we are just going to visit and make our way around by ourselves” they tend to get a look on their faces that speaks “Really? Better you than me”. And, when they learn that we don’t speak Spanish, well, it’s more like “REALLY? You’re nuts!” I do take some consulation knowing that some of these folks are the same ones that say “do you sleep on your boat every night, all winter?”. I guess we will have to see if “WOW, THAT’s SO COOL” carries the day or if it turns out to be, well, not so cool in the end. This plan isn’t completely without precedent, as we visited Portugal for a month last year (y plane) and that went fine even though we didn’t speak the language and only had the first few days of travel and hotel planned out prior to leaving the US. Brenda handled all the bookings, on the fly, and it went swimmingly. You go girl! Those that know Brenda are aware that she doesn’t exactly bill herself as an “adventure traveler”. I’d say that she is just that and more when compared to many of the folks we know who favor tours for their international travel. Somehow, driving from place to place on a “hermetically sealed bus” with a bunch of other Americans, leaves us a bit cool. Perhaps it’s just because we are too cheap for all of that. For sure, that’s a big part of it as by our way of thinking, we can travel for a month or two, or more, aboard Pandora for what a week to ten days of “real travel” would cost. However, as Brenda has reminded me from time to time, that doesn’t count the cost of Pandora. Point taken Brenda but we won’t dwell on that right now. Another issue that we will have to face relates to where you must depart from to go to Cuba. We may be required to begin and end our visit from US soil without an interim stop in another foreign country. And, as we would like to first travel to the Bahamas and then on to the southern coast of Cuba and back to the US, that may prove to be a problem for us. We do plan on spending time in the Bahamas prior to heading to Cuba so if we are told that we have to head back to the US prior to going to Havana, that’s going to pose a logistical problem for us as it will entail a lot of backtracking. I am hopeful that the folks that are reviewing our application understand that our desire to visit Cuba includes the “real Cuba” which means visiting some of the more rural areas. Including the southern coast is a must for us and going there from Havana, against the strong easterly trade winds just isn’t practical. I’d love to write about the things that we encounter along the coast and contrast that to what the more cosmopolitan Havana has to offer. And speaking of “real Cuba”, I ran into this video by a couple that produce the “Naked” series of travel videos. Yes, I will admit that the title did attract my attention. However, more to the point, they travel the world on a tight budget and tell their story. And, the story they tell about Cuba is a compelling one indeed. I guess that we will just have to wait and see what “State” and “Commerce” decide to do about all of this. However, I do so hope that they give us the “go ahead” to do the trip and will let us do so in the the way we have planned. 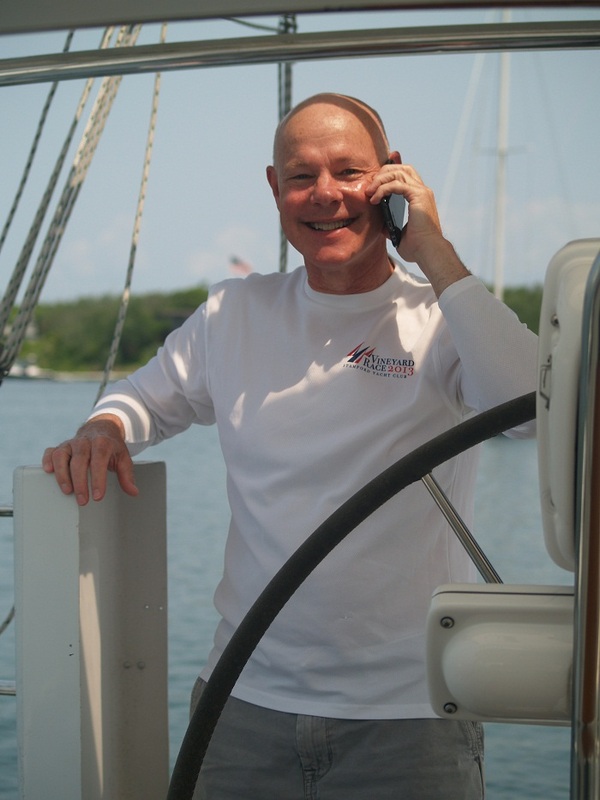 Besides, I “sort of” have approval from Brenda to do the 350nm run from the Bahamas to the south coast with me. Amazing. Anyway, I guess all of this will become clear when Uncle Sam gives us the word. I sure hope that it’s a simple “sure, go for it”. Then, we will see what Brenda really thinks. New Mexico makes me feel warm. 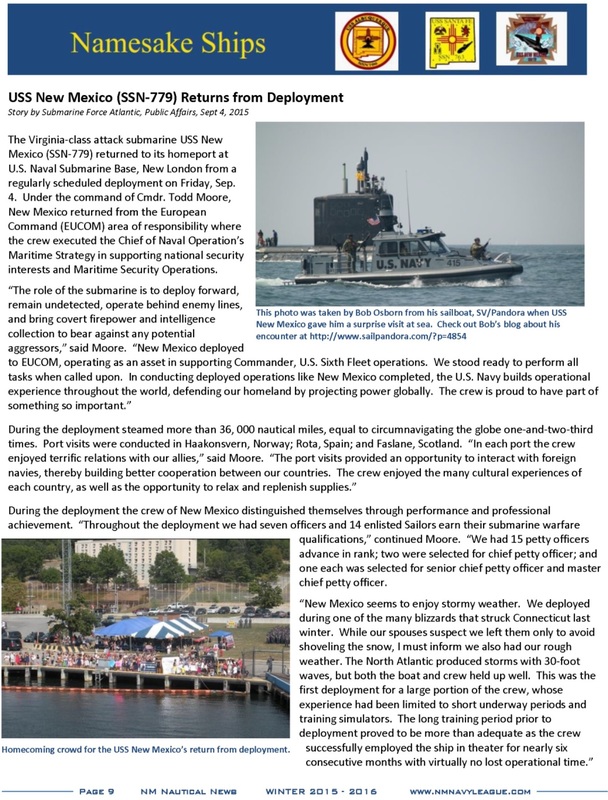 It’s Wednesday morning and today when I checked my e-mail, I was greeted by a note from Damon the President of the New Mexico chapter of the Navy League, sharing a copy of the League’s quarterly newsletter. Damon is the guy I have been in touch with as a result of my chance encounter with the USS New Mexico submarine off of New London back in early September. I wrote a post about that day and if you missed that post, here’s a link. It was an amazing experience. 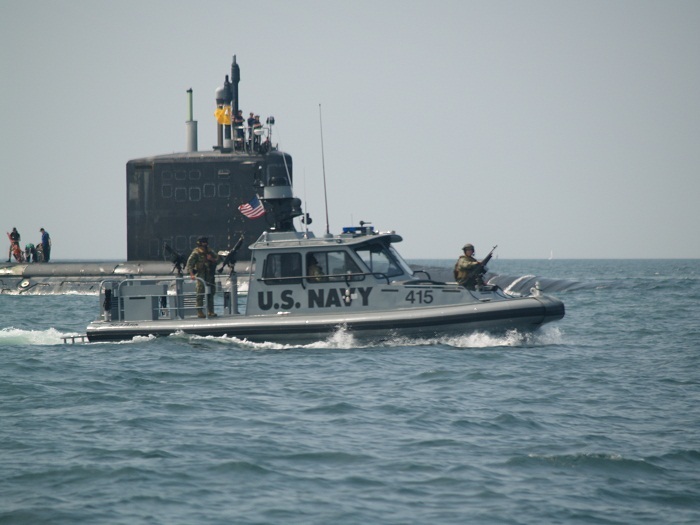 As a contrast, when I was taking Pandora south a month or so ago, I was off of GA and was hailed by a Navy ship on the horizon that told me to divert so that I wouldn’t pass within something like 7 miles, a very different experience than the one I had with the USS New Mexico. Clearly, the “rules” are a bit more lax in the confines of Long Island Sound. Or, perhaps they wanted to get a better look at Pandora. Yes, I’m going with that. Whatever… As I was saying, a ride on a nuclear sub? Now, that would be a hoot and a half. The skipper of the SV Pandora meeting the skipper of the USS New Mexico. You can’t make this stuff up. I have to say that all of this makes me feel warm all over, which I really, really need as it’s getting chilly, no make that %$#@#$% COLD, here in CT.